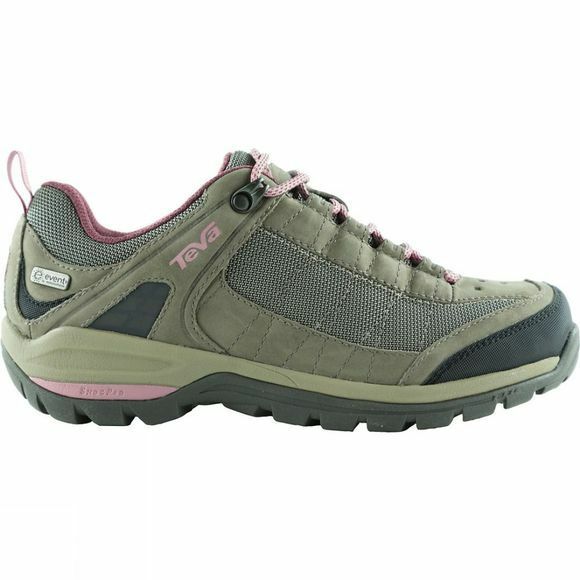 The Women's Kimtah eVent Mesh is a durable and hardwearing shoe that will see you through most low level hikes. The eVent waterproof and breathable membrane will keep your feet dry and reduce the sweat that can often build up in waterproof footwear, keeping your feet dry by using the correct socks and breathable footwear is a key element for blister free feet. Even though the eVent membrane will keep your feet dry the leather and mesh upper is water resistant to ensure the fabric will not wet out and block the pores of the eVent membrane, it also helps the fabric last longer. A nylon shank down the sole unit of the boot gives torsional rigidity and stability while the Spider365 rubber outsole provides durability and grip in all types of environments. A soft Shoc Pad in the heel enhances the comfort and feel of the boot.